The Family | Carnahan & Sons, Inc.
Ross was born to Lowell and Ruth Carnahan on April 15, 1943. He attended Fritchton School, where he graduated as Salutatorian in April of 1961. He studied at the Purdue Ag Winter Short Course in 1962. Ross married Jane Combs in 1964, and their son Dirk was born in April 1965 followed by daughter Kris in 1967. They built a new home for their family in 1970. Dirk is an attorney in Vincennes and Kris has an insurance business. After his divorce, Ross married Doreen Grigsby Edwards, who shared his love of horses. She expanded Ross’ world, and they owned a vacation home in Carefree, Arizona. Later, they moved their winter home from Arizona to Winter Haven, Florida. She tragically and suddenly passed away in December 2008. Ross is now married to another delightful horse lover, Rhoda (nee Hall). They live in a modernized and enlarged version of Lowell and Ruth’s house here on the farm. Ross has 5 grandchildren, and one of them, Brandon Knight, works at the farm and is an ag student at nearby Vincennes University. Brandon’s sister Megan is married and living in Kentucky. Grandson Payton Carnahan attends Vincennes Rivet HS, and Granddaughter Hope Kelly is a student at South Knox. Hope’s sister Haley is a student at Vincennes University. Ross is a mechanical expert; when we have something that we can’t figure out how to make it work, we call on him to show us how to fix it. He has always been the expert equipment operator, being known for the quality and quantity of his work. He takes charge for the decisions about what corn hybrids to select, and he still operates the tractor during corn planting. He has adapted to the new technology of AutoGuidance in the tractor; the GPS-guided tractor now makes only slightly straighter rows than Ross did with his own hand. He drives the red combine during harvest, and he knows how to adjust it property to get maximum quality through it. It goes without saying that Case-IH is his favorite farm equipment. He is responsible for all the marketing of the grain, and he maintains a close relationship with those folks that purchase our grain. He is the ‘field general’ during harvest, directing all the folks in the proper places and times. Some folks have asked Ross when he is going to retire. His response is, “I already am retired!” He spends his January through March (usually) in Winter Haven, but still conducts the marketing of the crop from there. Ross was named “Outstanding Alumnus” of Fritchton High School in April 2012. Ross inherited a love of horses from his Grandpa Welker S. Carnahan. He has a long history of working with American Quarter Horses. He has developed a specialty in the event of Pole Bending. He has conducted seminars in training horses and their riders from Maine to California, Florida to Alaska. He has even had international students come to his facility to learn horsemanship. Ross was an original founder of the National Pole Bending Association, which now has 1000+ members. He was the first inductee in the National Pole Bending Association Hall of Fame. His silhouette is part of the logo for the NPBA. Ross is a 13-time American Quarter Horse Association (AQHA) World Champion in Pole Bending. His number of championships in a single event, and the number of champions that he has owned and ridden all put him at or near the top of th AQHA record list for those things. He has been the AQHA high point earner many times on many different horses. He is the featured star of Championship Pole Bending, a training video he produced in the late 1980s. It is still the most respected and well-known training video on pole bending. Other than the AQHA and NPBA, he has competed in and had big wins or championships in the National Barrel Horse Association, International Barrel Horse Association and others. It would be difficult to number his wins at other competitions around the nation. Ross has an easy-going nature, making it comfortable to maintain pleasant relationships. He has been working with Dennis and John and Brandon on a transition plan to equip and structure Carnahan & Sons for the future of the next generation of farmers. John was born to Dennis and Pat Carnahan on September 22, 1986. He attended South Knox Schools and graduated in May, 2005. He then went to Purdue University, majoring in Agricutural Economics, graduating there with honors in 2009. He was married to Ashley Mouzin in July 2010. Their first child, Ella Marie, arrived on August 15, 2012. Daughter #2, Molly Kay, arrived on February 7, 2015. John has done extensive research into the Carnahan family history. He has discovered our Irish ancestry back to William Carnaghan, (the spelling of the name was American-ized to omit the silent ‘g’) who was born 1804 in County Donegal in the north part of Ireland. John is not certain of his exact date of William’s arrival in the US. But he has discovered that William’s son John was born in 1827, in Daviess County, Indiana. 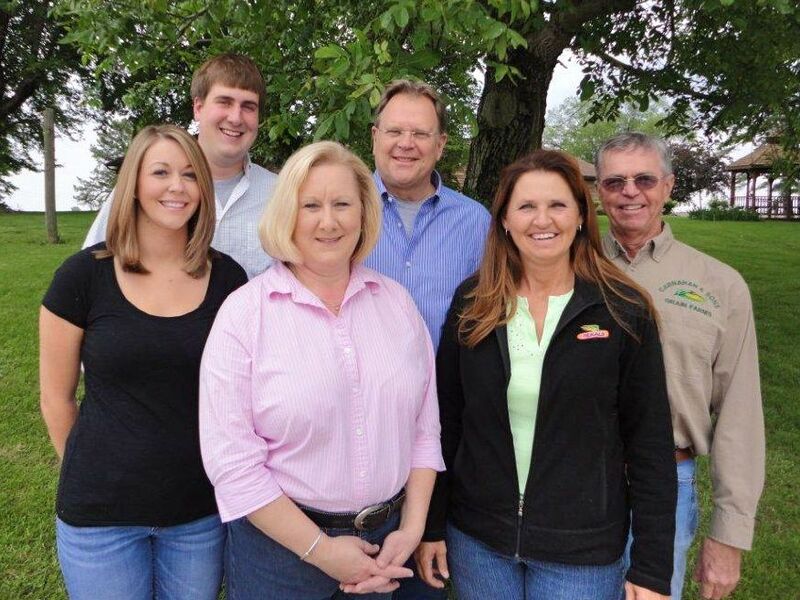 Since William Carnaghan arrived in southwest Indiana, there have been Carnahan family farmers here in Knox County. John approaches his work with a careful attention to detail. He wants to ‘get it right’. He is responsible now for making certain the fleet of equipment and trucks is properly maintained. He has taken charge of all matters pertaining to pesticide application. He is an expert operator of the high-tech JD 4730 sprayer. He has taken special attention to the Peterbilt semi-truck, and it shines like new almost all the time. With the upgrade to the new dryer, John now takes the lead on its operation. He takes command of new technology very quickly. John is a fan of his Purdue Boilermakers, and the St. Louis Cardinals. He attended the first game of the 2011 World Series in St. Louis. He is a fan of Star Trek—the original series, and ‘the Next Generation’. He appreciates most country music, especially Garth Brooks, George Strait, Milo Jenkins, and Dusty Chandler . John and Ashley are members of the Disney Vacation Club, so they continue the family tradition of being Disney fans. Like his dad, John loves John Deere farm equipment. John is eager to continue the growth of the farm, and has many ideas for the improvement for the operation and the facilities of Carnahan & Sons. He is already beginning to put his ‘touch’ on the farm. Dennis was born to Lowell and Ruth Carnahan on February 19, 1953. He attended Fritchton School from 1st to 8th grade. Fritchton was consolidated into South Knox High School where he attended high school, graduating as class Salutatorian in 1971. He enrolled in the Agriculture program at Vincennes University, and graduated with an AS degree in May of 1973. He continued his education at Purdue University as an Agronomy major, and graduated in 1975. He returned to the home farm and continued his work there, soon taking over the financial bookkeeping duties. He assisted in the change of the farm to a corporation in August of 1977. His role now includes the bookkeeping, and all matters in dealing with the Farm Service Agency. He works extensively with development of crop budgets, cash flows, and financial forecasting. He helped the farm adopt computer-based financial records, beginning in 1984. Several generations of software and systems later, the books are now in a ‘hosted’ environment, accessible from any web-connected computer. He maintains the electronic records of all field operations, and writes the ‘prescriptions’ for the map-based seeding of corn and soybeans, in both the Case-IH AFS system and the John Deere Operation Center system. He continues to promote the adoption of advances in technology. Dennis’ life improved when a new girl entered the Sunday school class he was teaching in the summer of 1973. That beautiful girl was Pat Klein, and he got the courage to ask her for a date in November 1973. Their relationship took off, and they were married on July 28, 1978. They worked hard together, Pat driving farm trucks at harvest, and still maintaining their home. After living those early years in a mobile home, in May of 1980, they moved into their newly-built home at the farm. They remain there today. In November 1982, they welcomed their first son Philip, followed by John in 1986, and Ben in 1990. All three played several high school sports including golf, soccer, and basketball (Dennis’ favorite sport). Philip graduated from Indiana University in 2005 and received his MA in Arts Administration from University of Oregon in 2011. He lived and worked in Portland, Oregon — until his untimely death due to cancer in February 2018. John is a 2009 College of Agriculture graduate of Purdue University. He is married to Ashley, and they are the parents of our granddaughters — Ella, born in August 2012 and Molly, born in February of 2015. Ben graduated from Purdue in May 2013 in Professional Flight. He is a Captain for Republic Airways. He and his wife Kierstin live in Indianapolis. Dennis was a member of Class VII of the Indiana Ag Leadership Program (now known as the AgrIInstitute). He thoroughly enjoyed that two-year experience. He made new friends across Indiana, traveled with the class to Washington DC, Nicaragua, and Costa Rica. From that ALP experience, he and Pat were introduced to the hosting of French agricultural college students. From 1996 to 2013, with the help of neighbors, they have become family to 31 different students, and maintain a close relationship with them and their families. Many of those students are now married, and many are making Dennis and Pat “grandparents francaise”. Traveling to France 4 times, Dennis and Pat have increased their appreciation for those relationships. Dennis is a member of Wheatland Christian Church, baptized there in 1966. He taught Sunday school, and served as the SS Superintendent for many years. He was ordained as a Deacon in 1977, and served to chair the Christian Education Department. He was ordained as an Elder in 1995, and he continues to serve in that capacity. He was Chairman of the Elders 2005-2013, and 2014-2015. Dennis has worked in the Knox County Farm Bureau, and serves on the Board of Farmers’ Home Insurance Company of Knox County, currently as VP. He was appointed by Governor Frank O’Bannon to the Indiana Commission for Agriculture and Rural Development (ICARD), and served 2000-2004. He served in 1986 to 1992 on the board of Camp Illiana, a Christian Retreat center at Washington, Indiana. He was involved extensively in the development of the Lakeview and Valley View Lodges at Illiana. First elected in 1996, Dennis served five 4-year terms on the South Knox School Board, retiring from that service in December 2016. He led the advocacy group for the promotion of a new elementary school in 1996-97. That building opened to students in fall of 1999. He has held every school board office and served as the Board’s legislative liaison. He has found some of his greatest satisfaction in this school board role, and takes great pride in the superb reputation of South Knox schools. Dennis served the Indiana School Boards Association (ISBA) on their Federal Relations Network 2004-2013, and was named by the ISBA as a Master Board Member in 2010. Dennis was honored to be named an “Indiana Master Farmer” in 2001 by the Indiana Prairie Farmer magazine. Dennis loves basketball, and thoroughly enjoyed his sons’ playing days at South Knox High School. He would say some of his best days were spent on the bleachers watching Philip, John, and Ben. He is a loyal fan and supporter of the Purdue Boilermakers. He loves to travel, with Disney World being one of his favorite destinations. He has been in 49 of the 50 states, with only Alaska remaining. He and Pat recently completed the final leg of his goal to travel all 3073 miles of US Highway 50. They saw 50 West in the summer of 2011, and 50 East in summer 2012. Dennis looks forward to continued work on the farm, hoping to see it continue to grow. As John assumes more and more responsibility, it should free some more time for Dennis and Pat to travel. He does not envision retirement to Florida, or even winters there, for he would miss the local basketball, and playing with his granddaughters. Brandon was born to Robert and Christine Knight on June 11, 1993. He has an older sister Megan, and a niece Raelynn. He attended South Knox Schools and graduated in May, 2012. He then went to Vincennes University, majoring in Science Technology of Agriculture, graduating there in 2016. Brandon has always had a love for agriculture. His grandfather Ross Carnahan began teaching him many things about farming at a young age. His grandfather John Edwards has also taught him many valuable lessons about farming. From that point on Brandon knew farming was the profession he wanted to pursue. At Vincennes University, his advisor Susan Brocksmith taught him many new things and made the “college experience” a bit more interesting and challenging. Overall it was a great experience for him. Choosing to continue his education at Vincennes University also made it to where he could work part time on the farm, which was a blessing to Brandon. Brandon approaches work with a very positive attitude. He is always eager to help others out on the farm when needed. 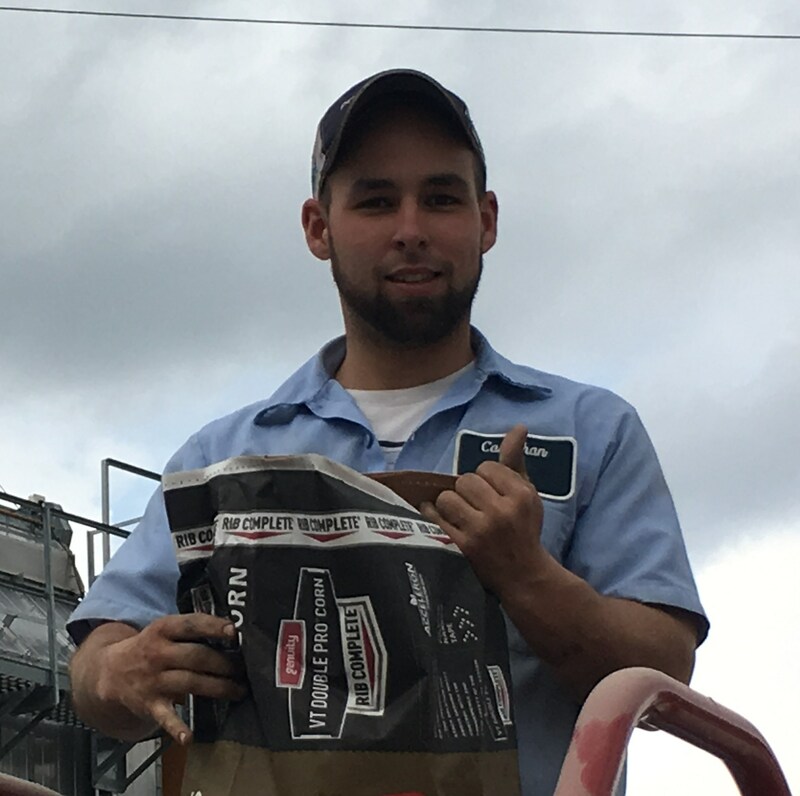 Brandon enjoys hauling grain on the farm and is always eager to run equipment. Brandon also takes pride in the Peterbilt semi-truck. He likes both the semi and hopper bottom shining like brand new. Brandon and John do all of the servicing of the equipment and elevator. They work really well with each other on the farm, which makes things easier. Brandon enjoys Pole Bending and Barrel racing with his horse Git Go Gone. His grandfather Ross has also taught him everything about the sport of Pole Bending. Brandon and his horse Git Go Gone have been very competitive the last few years and have many accomplishments. Brandon also enjoys watching basketball, football, and baseball. He enjoys spending quality time with family as well. Brandon is eager to continue the growth of the farm. He enjoys working with the team at Carnahan & Sons to make things happen. He is optimistic about the future of agriculture and looks forward to helping and watching it grow. Are you interested in the family history of William Franklin Grigsby who married Adella Carnahan in Vincennes, Knox Co. IN ? Franklin was born 10/11/1866 and Adella was born 10/22/1874. They are buried in the Davenport Cemetery of Davenport, Delaware Co. New York. Adella Carnahan was the daughter of Joshe Carnahan and his wife Ellen Fox. I A member of the Grigsby line still lives in that area. I am looking for the father and ancestry of William Franklin Grigsby believed to be John Grigsby born circa 1840. He is reportedly buried in Lawrenceville, Lawrence Co. IL. Thank you for contacting us. I will give your message to my son John. He has done extensive study of our family history. Good luck with your search. I have been searching Carnahan history also. William is buried at Bethany Cemetery near Montgomery. When he died John was sent to live with McKinley in Busseron Township. Chapel. (She died in childbirth with her 5th child). He remarried but moved to Kansas after his second wife died. his son Enoch remained and was Welker’s father and Lowell’s grandfather. Thank you, Jane. Some of this is new information, especially about William’s burial site. We’ll have to check that out soon. I am seeking information on the ancestors of William Franklin Grigsby (10/11/1866) who married Adelia Carahan (10/22/1953) in 1891 in Indiana.. I have her in Vincennes, Knox Co. IN as the daughter of Josha Carnahan and his wife Ellen Fox. William and Adella moved to New York and are buried in the Davenport Cemetery of Davenport, Delaware Co. New York. William Franklin Grigsby is believed to be the son of John W. Grigsby born circa 1823 in Breckenridge Co. Ky and seems to be found there and just across the state lin in Perry Co. Indiana.. He is believed to have had as one wife Sarah Watson (1830-1882) Stephensport, Breckinridge Co. KY. John W. Grigsby is reportedly buried in Lawrenceville, Lawrence Co. Illinois. I have not yet found his grave there. I do not know John W. Grigsby’s ancestry. Any assistance or information is greatly appreciated. Hi my name is Randall Carnahan I was wondering if your family would know a grace Carnahan? Our Grandpa Welker S. Carnahan had a sister Grace. She married Wilbur Lochmiller, and she is buried in the Wheatland, Indiana cemetery. I recall my dad speaking about his ‘Aunt Grace’. My daughter owned Moonlights and was very successful with him running barrels. Do you by chance remember the register name of Moonlights? If so please email to drapersteelinc@aol.com. Thank you!